Law #1: The understanding, attention and retention of your audience is inversely proportional to the length of your presentation. The longer your presentation, the lesser your audience pays attention, remembers and understands. Keep your presentation as short as possible. Law #2: A picture is worth a thousand words. A video is worth a thousand pictures. Sometimes just one picture is equal to a paragraph full of words. A video is even more powerful. It an audio visual medium and engages the audience better than even pictures. Stop your reliance on plain text. Make it interesting and entertaining with pictures and videos. Law #3: The power of a slide is inversely proportional to the amount of words on the slide. The more words on the slides, the worse the slide becomes. Great slides are low on text. Bad slides are text heavy. 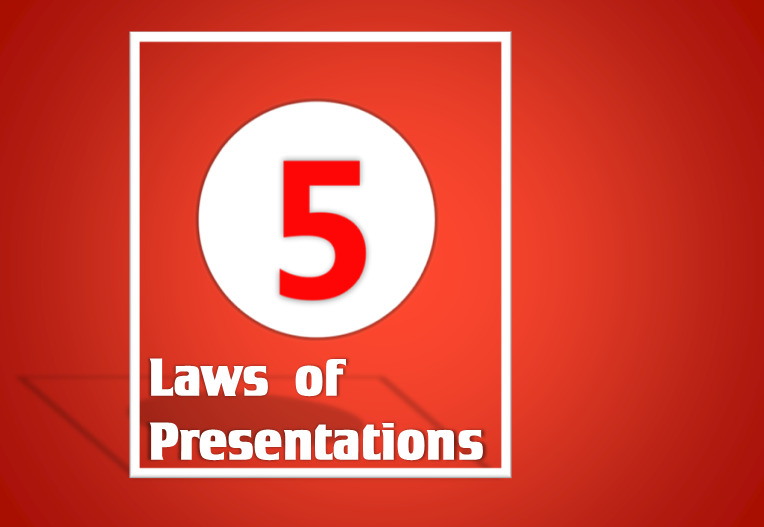 Law #4: Effective delivery of your presentation is directly proportional to the amount of practice you have put in. The more you rehearse, the better you deliver the presentation. The more you practice, the more confident you become. There are no naturally born presenters. Practice is the difference between great and average presenters. Law #5: Your audience mirrors you. Your audience mirrors your behavior and state of mind. If you are positive, passionate and confident, your audience feels the same way. If you enjoy the joke you just made, your audience will enjoy the same. A nervous presenter makes the audience uncomfortable too.